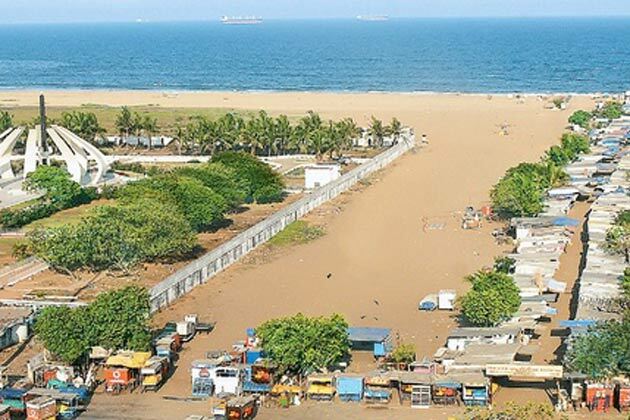 Marina beach one of the urban beaches in India attracts the tourists for the beautiful crafts and structures built along it. Major half of this beach lies along Bay of Bengal and another little half along Indian Ocean. It is the longest beach of India as it stretches for 13km from fort St. George to Mahabalipuram. This urbanized and decorated beach attracts tourists throughout the year and mostly during winter it remains crowded. Along the road the beach has been decorated with statues and beautiful parks. Due to this decoration of the beach along the road, visitors love to stroll and walk along the beach. The beach is strictly prohibited for swimming and surfing due to presence of strong undercurrent but there one will find a lot of other activities on the Marina beach. One can go for cruising and parasailing on this beautiful beach. One can get a lot of Memorial structures, statues and one aquarium in the beach side to stay engaged. The beach has numerous things hidden in its lap and the visitor has to uncover this beauty. The beach with lot of statues, fort and parks offer diverse ways of entertainment to the tourists. The tourists can go for searching the serenity along the coast in the evening hours. The evening hours bestow dramatic view of the sunset and the orange-aura on the beach brings the most beautiful scene alive on this earth. Walking and strolling around the beach during the evening hours gives one of the more enthralling experiences. Due to the extreme climate in Chennai, tourists prefer staying on the beach during morning and evening hours. Most of the hours in the day, it remains uncrowded. There is a drive surrounded with palm trees along the beach. That adds a panoramic view to the beach. As most of the water activities are prohibited on this beach, simple strolling on this beach during the sunset enthralls the tourist. During the walk on this promenade one can see greatly built statues at the conjunctions. Beautifully sculpted statues of patriots and famous personalities can be found on the conjunctions. The artful work creates noteworthy sight to be enjoyed. This art not only enhances the beauty of the environs it also create great nostalgic experience of pre-independence. One can find other structures along the road. The monumental buildings like the senate house of the University of Madras and 19th century Presidency College are other attractions on the beach. One can also see the Anna and MGR memorial in the nearest area. The ice house and the aquarium in the nearby area are great to be visited by the outside tourists. The ice house is a pre-independence structure that was used for storing ices brought from the lakes of North America. And the aquarium preserves many marine species and fresh water fishes. The visit to this aquarium makes one know about the sea life in the Chennai coast. One can greatly quench his cravings with local food items like murukku and other south Indian snacks in the nearby stalls. One will easily get many stalls located in the beach side. There one will also get many soft drink stall to quench one’s thirst. The availability of food items in the nearby location makes the visit to the beach more enduring. This makes one sit and stroll for hours without getting tired along the Marina beach.